When to Get Braces | Orthodontics tips and reasons! You asked is it better to get braces as an adolescent or adult? We’ve answered! Although you may have the mental image of braces belonging strictly to teenagers, the reality is that there are situations that call for the use of braces for patients of all ages. Reason # 1: You have aesthetic concerns. Crooked teeth, an overbite, and unevenly spaced teeth can make people feel embarrassed to smile. Whether you are young or young at heart, you want to feel confident about your appearance, and braces can help correct orthodontic problems. Reason # 2: You want to improve your long term oral health outcomes. While a concern for aesthetics is important, orthodontic care is a priority reason for getting braces. It’s possible that you postponed getting braces as an adult due to economic reasons, or perhaps you developed dental problems later in life. 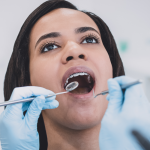 Whatever the reason, it’s essential to treat crooked teeth, overbites and underbites,and overcrowding problems, because neglect can cause you a variety of health problems, from predisposition to cavities to gastrointestinal issues. Reason # 3: Your teeth have shifted. 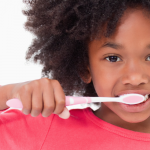 While you may not have problems as a child, as you age, your teeth shift, and this can cause problems. Teeth shifting can be caused by a variety of factors, such as genetics, grinding, cavities, or just plain bad habits. 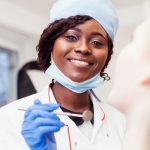 Regardless of why your teeth have shifted, it´s important that you address it right away because not doing so can lead to numerous problems in the future including the degradation of your other teeth. Reason #4: You have constant headaches. Believe it or not, headaches can be caused by many dental issues. If you have an overbite or underbite, it´s not uncommon that you get headaches during the time between breakfast and bedtime. Why? Once you start chewing your food, the abnormal bite begins to interfere and your jaw goes off-center. This in turn causes you to develop headache. Your headaches may even become migraines. However, good orthodontic work can help to resolve this issue. Reason #5: You have jaw pain. 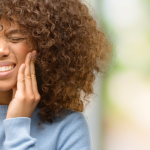 The presence of jaw pain when you’re eating or speaking, along with a popping sensation whenever you open your mouth, may indicate a problem called temporomandibular joint (TMJ). TMJ pain develops in your jaw and could spread to your face and jaw. There may be a grinding or clicking noise when the joint opens as you’re eating or speaking. If this is happening to you, you need to go to your dentist ASAP to get to the bottom of these headaches. It´s important to fix problems with your jaw or bite as soon as you notice them. Braces: Where’s my best solution? 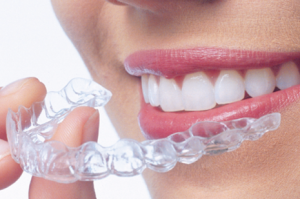 Most adults will wear their braces for twelve to twenty months. Orthodontics are a commitment for you and your health, which makes it all the more important to find a great doctor who you trust. At Penn Dental Medicine, you get deeply discounted services from top-notch professionals. A team of specialists will assist your treatment by a dental student. You have the assurance of our reputation and the perk of reduced cost. Don’t wait to get started with your first consultation. Use this 25$ off coupon for your first visit! Related Tags: When to Get Braces | Orthodontics tips and reasons!